Robert Norman George Barlow was born on 22 April 1911 in Carlton, a suburb of the Australian city of Melbourne. He was always known by his middle name, Norman. 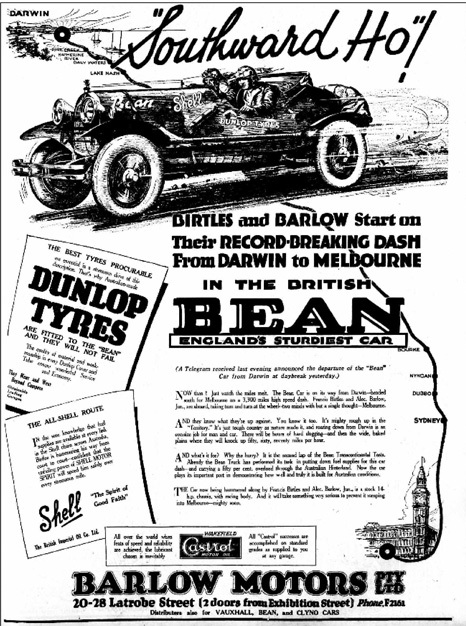 The Barlows were a colourful family: Norman’s father Alec Barlow had built up a thriving motor business, Barlow Motors, which sponsored the adventurer Francis Birtles and Robert’s older brother Alec Jr in their record-breaking drive from Darwin to Melbourne in 1926. The pair covered the 5438km distance in 8 days and 13 hours. The car they drove, a Bean nicknamed ‘Sundowner’, is now in the National Museum of Australia. The Barlow family houses, business premises and stables were all designed by the fashionable architect Arthur Purnell, with whom Alec Barlow Sr went into business. But many of his ventures were very close to the line and having defrauded a wealthy merchant of a large sum of money, Alec Sr committed suicide in 1937. It seems that, by this time, Norman Barlow was working in the family business, as his occupation was given as ‘service station proprietor’ when he joined the RAAF in April 1941. He was a qualified private pilot, so it must have been obvious that he would be chosen for training to carry on that role. As was customary for most Australian pilots under training, he was sent to Canada and received his pilot’s flying badge in January 1942. He was also commissioned. Further training followed, and by March he was in the UK. In September 1942, Barlow was posted as a Lancaster pilot to 61 Squadron, based at RAF Syerston and began a successful first tour of operations. His regular crew included flight engineer Leslie Whillis and bomb aimer Alan Gillespie, both of whom would later accompany him to 617 Squadron. Throughout his many operational sorties, this officer has displayed the highest courage and devotion to duty. He has participated many attacks on Essen, Berlin, Hamburg and Cologne, and on two occasions he has flown his aircraft safely back to base on three engines. During periods of the most extensive operations Flt Lt Barlow has set a magnificent example of courage and determination. The award was confirmed in the London Gazette two days before the Dams Raid. Towards the end of March 1943 all 5 Group bomber squadrons were asked to supply an experienced crew for the new squadron being formed at Scampton. It would seem that Barlow volunteered and set about building a crew to accompany him. Some of them had already completed a full tour, the rest were very near the end of the first. Whillis and Gillespie came from Barlow’s own crew. Barlow knew fellow Australian Charlie Williams well, so he was a logical choice as wireless operator. Navigator Philip Burgess had been in Williams’s crew, so he was invited, and the two gunners, Harvey Glinz and Jack Liddell completed the set. Together, they were an unusual group. Three were in their thirties and six were commissioned officers, with only the young Jack Liddell still a sergeant. Six weeks of intensive training followed, first by day and then later by night. Barlow’s last training flight was the day before the raid, on Saturday 15 May. With Vernon Byers as second pilot, they did another test bombing run over the range at Wainfleet. Two days before the raid, Bill Astell had asked Barlow to witness his will. As a married man with a daughter, Barlow had written one already and left it behind in Australia. The crew were probably nervous, but didn’t want to show it. In his last letter home, wireless operator Charlie Williams told his family that ‘[Barlow] is very thrilled today as he has just been awarded the D.F.C. [H]e is a very good pilot and I have every confidence that he will bring me through my second tour.’ In the same letter, Wiliams confirmed that both his and Barlow’s names had featured in a radio broadcast heard by his family at home. It is likely that this refers to something recorded during their time at 61 Squadron. Barlow and his crew had been assigned to the Second Wave, detailed to attack the Sorpe Dam, and were due to take off one minute after Joe McCarthy. However McCarthy had a mechanical problem with one engine and had to decamp to the spare Lancaster, so Barlow’s AJ-E was the first Dams Raid aircraft in the air, leaving the ground at 2128. Because they were under instruction to maintain radio silence, nothing more was heard from them. But we know that they reached the border between the Netherlands and Germany for it was near Haldern, 5km east of the Rhineside town of Rees, that they crashed, ten minutes before midnight. It appears that they hit one of the pylons which stretch across the fields in the locality, although it is possible that the aircraft had first been hit by flak. AJ-E came to rest in a small meadow on the edge of a copse. All on board were killed instantly, their bodies badly burned. [We] saw the field in front of us blazing fiercely. An aircraft flying from the west had hit the top of a 100,000 volt electricity pylon and crashed into the field. A huge bomb had rolled out 50 metres from where the plane had crashed. Even before it got light we had a whole crowd of inquisitive people there despite the danger from exploding ammunition. It was not long before the Mayor of Haldern, Herr Lehmann, was on the scene and he climbed onto what was taken to be a large petrol canister. He said ‘I’ll tell the Chief Administrative Officer that he needn’t send us any more petrol coupons for the rest of the war. We’ve got enough fuel in this tank.’ When he found out later that he had been standing on dynamite he’s supposed to have felt quite sick. All the crew were killed and burnt beyond recognition. There were no flak batteries or searchlights here; the plane was just flying too low. The first guards from the scene of the crash came to the house and showed us the valuables which they had found: things like cases, gold rings, watches and a long cylindrical torch. Its owner had scratched all his missions on it – 32 of them. I still remember the name ‘Palermo’ and also the names of a lot of other towns. The unexploded mine was defused by one of Germany’s leading bomb disposal officers, Hauptmann Heinz Schweizer and taken to Kalkum, near Dusseldorf, for examination. Detailed drawings of the whole construction were quickly made, and the fact that the bomb had been spun before release was deduced (although it is not certain whether they ever worked out that it had in fact been spun backwards). 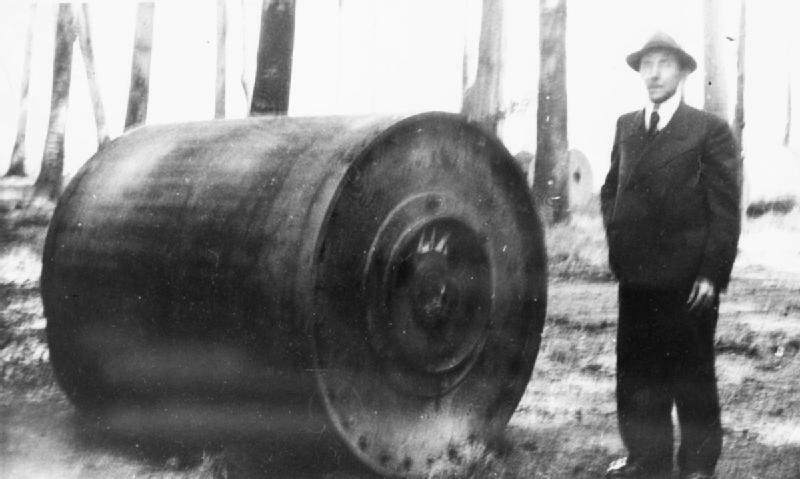 Local dignitaries took turns to pose with what was at first thought to be a petrol tank. Norman Barlow and his colleagues were all buried in the North Cemetery in Dusseldorf. But it took several months for news of their fate to reach the British authorities and then to be transmitted onto their counterparts in Australia. 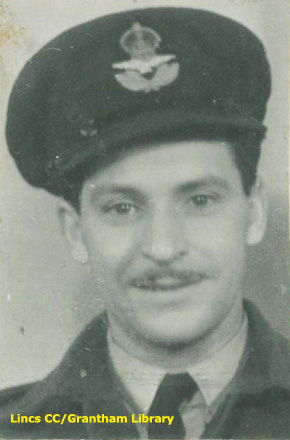 At this stage, Alec Barlow Jr was also a pilot serving in the RAAF, commanding a training school, and was quick to use his connections to see if he could find further information. After the war, Norman Barlow and his crew were reinterred in Reichswald Forest War Cemetery. Alec Barlow Jr had a long career with Qantas, and died in 1972. The site near Haldern where AJ-E came down is the only Dambuster crash site without a permanent memorial, but local historian Volker Schürmann is campaigning to get one erected. It’s possible that the wireless report might have referred to the March 1 raid on Berlin; there are Australian newspaper reports of the raid that mention both Barlow and Williams. Or it could have been an earlier one; the mail between Australia and England was slow at best. Here’s a link to one copy of the article: http://nla.gov.au/nla.news-page622084 (this actually references a raid on Hamburg on March 3 but mentions the Monday raid on Berlin and that Barlow and Williams both participated). A Gipsy Moth plane, carrying a pilot, Alexander Barlow (22), of Brighton, and a passenger, Hugh Hughes (24) of St. Kilda, taking off at Portsea this afternoon, crashed into a telegraph post on the Portsea road. The occupants escaped injury, but the plane was wrecked. The plane is used for pleasure purposes, and had been making short flights over the Portsea pier and landing on the cricket ground. When the machine struck a telegraph post it, wrecked a verandah and portion of Stringer’s store, Portsea.